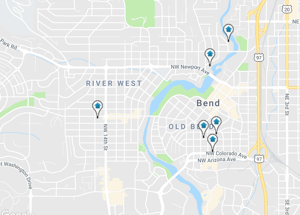 Back in 1981 when I moved my family to Bend from Portland Oregon the West Hills was the place to live. It had large expensive homes. They were all relatively new. The homes were on big lots and close to down town. Now the trees and landscape is all over 30 years old and of course the houses are too. But the west hills is still close to town and some homes have nice solar access facing south and some homes get a peak a boo view of Mt. Bachelor. Some of these homes are now dated but can be fixed up to be spectacular homes close to town.